What does it means to be an American? 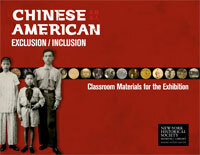 Chinese American: Exclusion/Inclusion explores this question as it chronicles the long and complex history of Chinese Americans in the United States. The exhibition and educational materials highlight more than 200 years of stories form across the nation, many of which connect directly with some of the most compelling themes in American history: immigration, American identity, westward expansion, racism and nativism, the importance of work and workers, and the power of individuals’ stories. In From Behind the Curtain: A Conversation with Amy Chin, the New York arts consultant reflects on her family, her childhood, and the legacy of the exclusion laws.